Inflexiball schooling well under Brian Hughes. CUSTARD THE DRAGON - Ran disappointingly at Newcastle after a finishing a good 2nd on New Years Day. No obvious reason why, its a bit of a mystery and its hopefully a race to put a line through. He's been dropped another lb by the handicapper and we are confident he will be winning again soon. 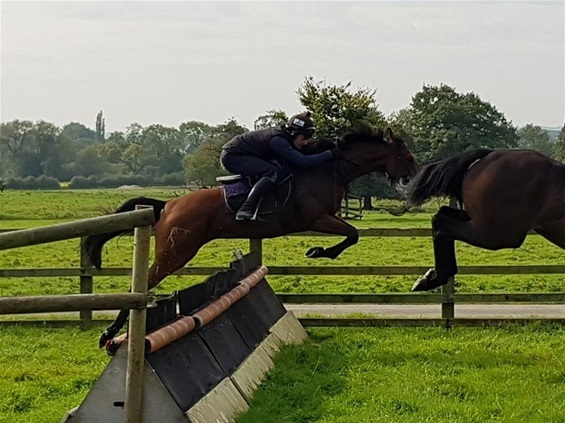 INFLEXIBALL - She is ready to run again and has been given an entry to make her jumping debut at Uttoxeter on Saturday 26 January in a 2m maiden hurdle. She will have another sharpener over the schooling hurdles in a couple of days and as long as it does'nt go too soft she should run. KINGS ACADEMY - He is back in light work after a break and is being built back up steadily in terms of his strength and muscle tone. We aim to have him fit and ready to run again around early March time, he's well handicapped and this could be a good season for him. TWO YEAR OLD FILLY - She is progressing well and cantering each day on the gallops, which she has been taking in her stride. She wont do anything serious just yet but she done all her prep work well with no issues. We are to hold a naming competion for her amoungst her owners over the coming weeks so all being well she will have her racing name soon. Next yard visit - We are aiming for around early to mid March - date to be arranged..